Okay, here’s what I did. For the pie: I made the crust. Preheat the oven to 325 degrees F. Drop the graham crackers into a good processor and pulse until entirely broken up into crumbs. Sprinkle the sugar and butter over the graham crumbs. For the apron: I cut out the pattern pieces. 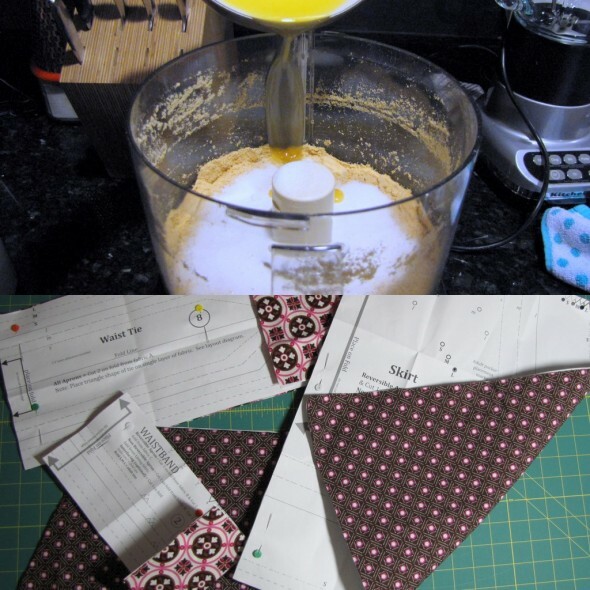 Line up the pattern pieces on your fabric and cut them out. For the pie: Pulse again until coarse and crumbly. Dump the mixture into your pie plate. 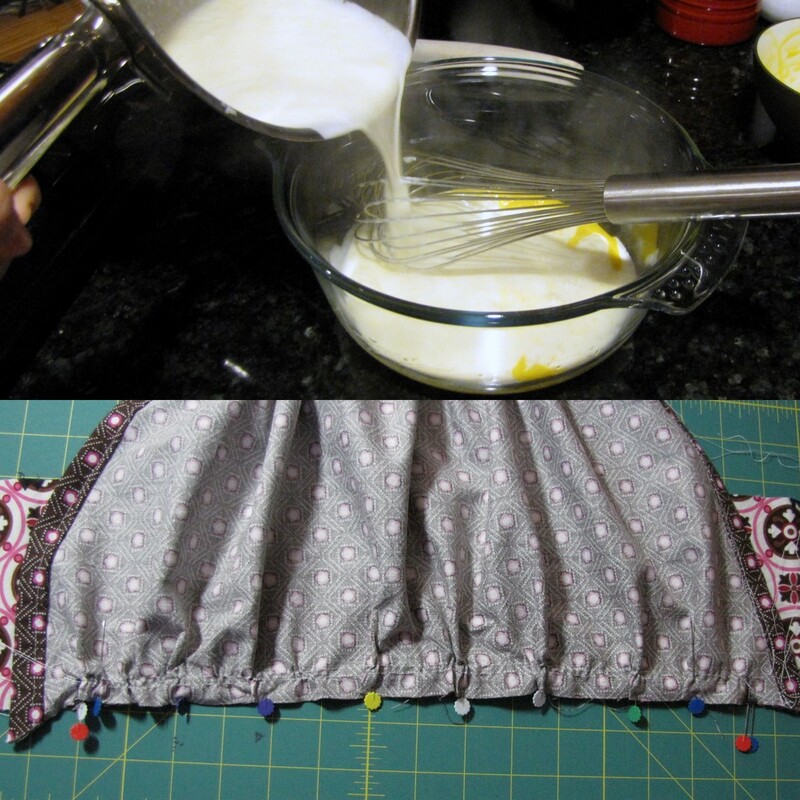 For the apron: Make the pockets. 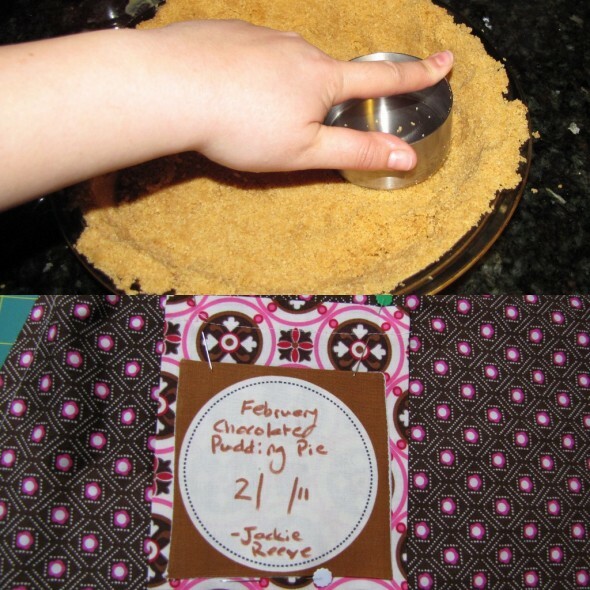 For the pie: Use a measuring cup to flatten the crumbs against the bottom and sides of the pan, making a crust. 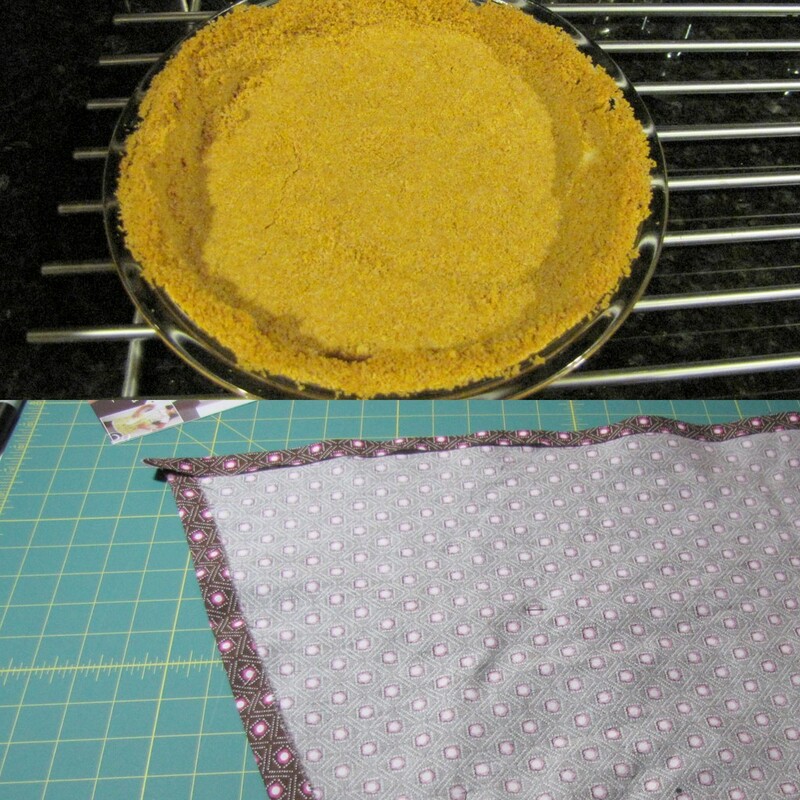 For the apron: Attach the pockets to the apron skirt. For the pie: Bake the pie crust at 325 for 13-18 minutes, until it’s brown and smells yummy. Don’t overbake it, I did that the first time and it was nearly impossible to cut. 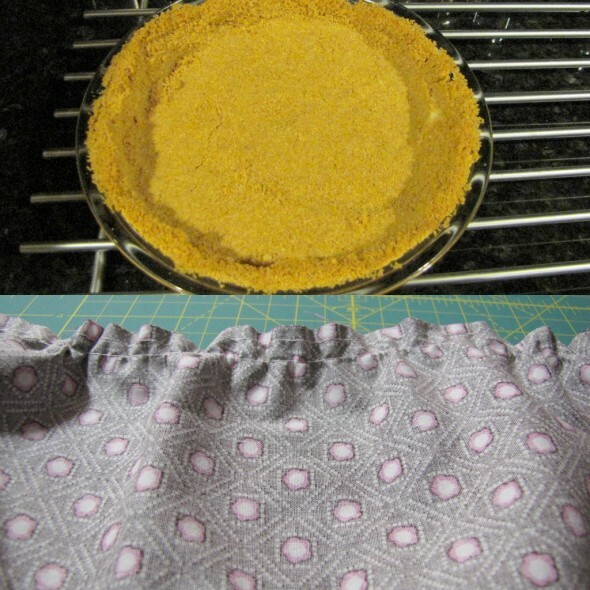 For the apron: Hem the skirt. For the pie: Let the crust cool completely. You could do it the night before and wrap it in saran wrap, or you could pop it in the fridge until the pudding is made. 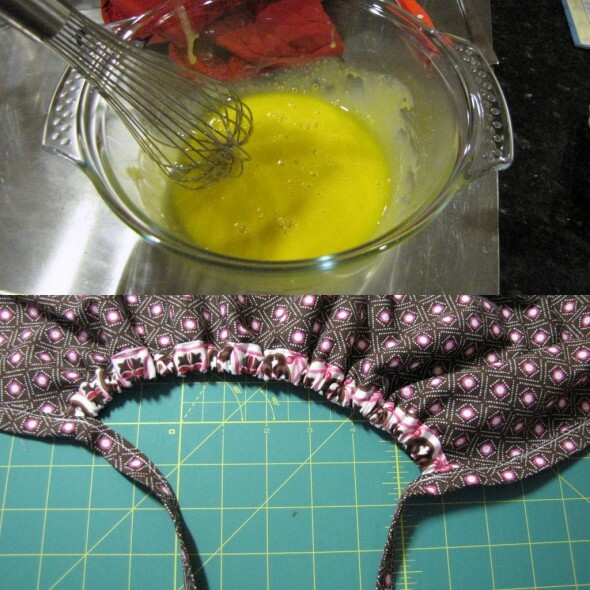 For the apron: Gather the skirt. For the pie: Make the pudding. Bring the heavy cream almost to a boil. This is hard, if it starts to boil just let it cool down a little before the next step. For the apron: Put the elastic on the bodice. For the pie: Beat the egg whites in a big bowl. For the apron: Put the neck straps on the bodice. For the pie: Slowly pour the hot cream into the bowl of egg yolks. Whisk quickly. For the apron: Attach the waistband to the bodice. For the pie: Pour the egg and cream mixture back into the saucepan. Heat for about a minute, until it’s thick and coats a spoon (this happened almost immediately for me). DON’T overcook it. 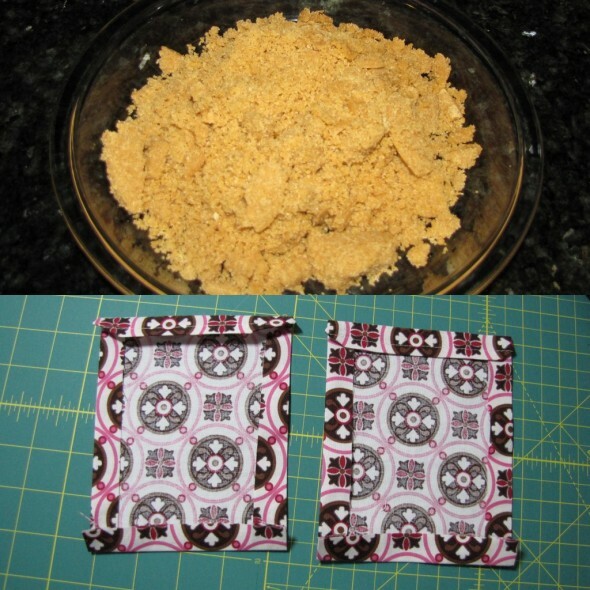 I did this the first time and the bottom of the mixture curdled, like the eggs cooked. 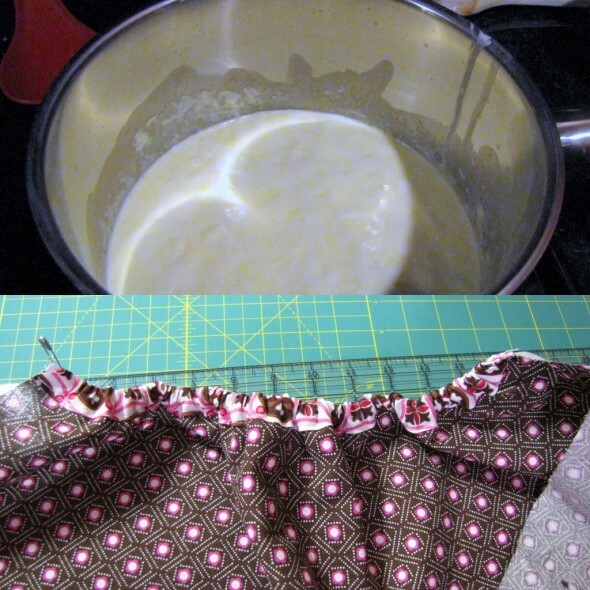 For the apron: Attach the skirt to the waistband. 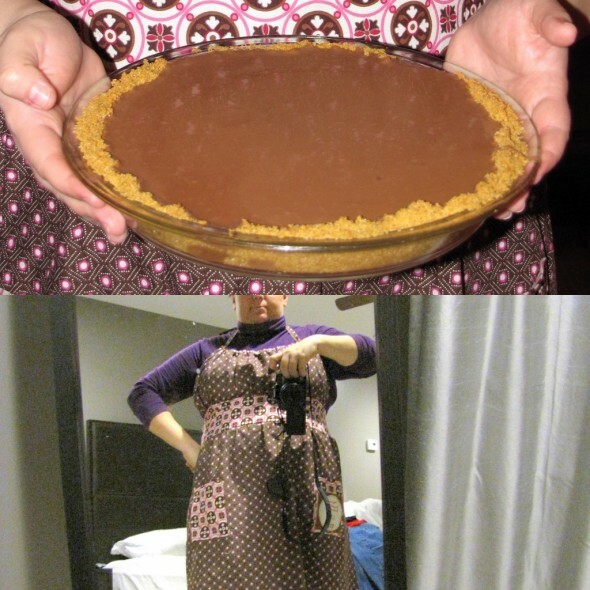 For the pie: Put the chocolate into the bowl used for the eggs/cream. 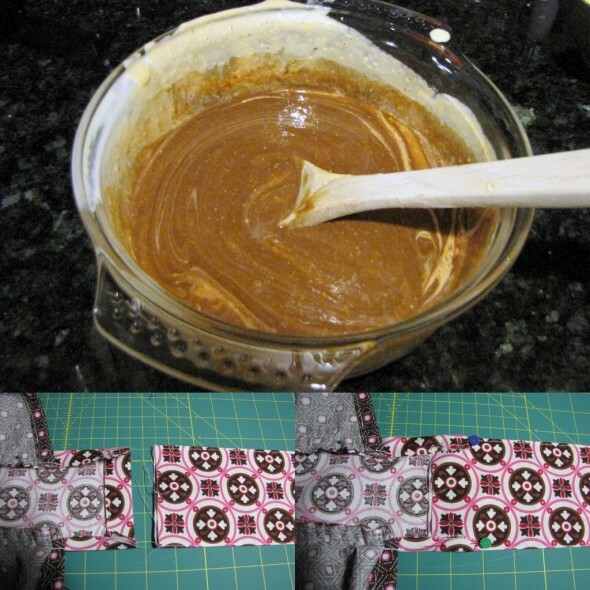 Pour the hot cream mixture through a sieve onto the chocolate. For the pie: Make the waist ties. I actually ran out of this fabric and had to make them half the length. This was fine for me. 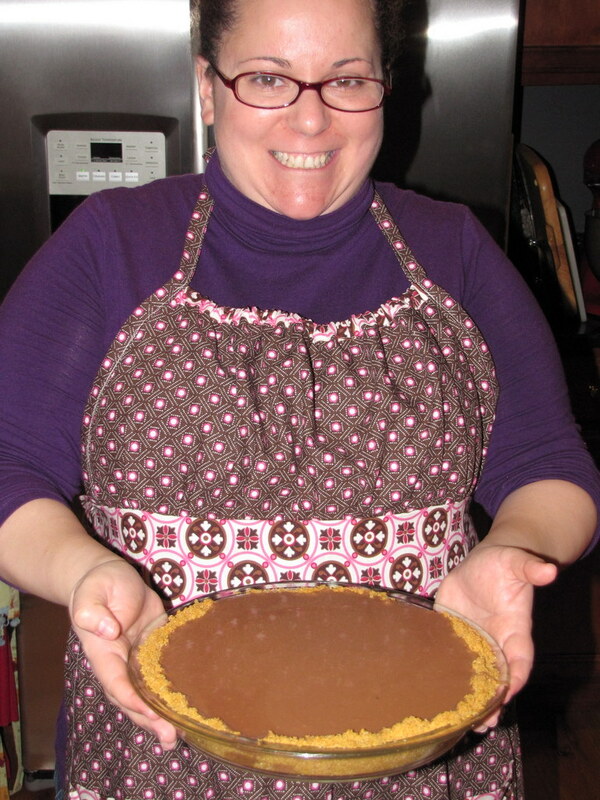 For the pie: Mix the chocolate and cream together until the chocolate is completely melted. For the apron: Pin the waist ties to the waistband of the apron. I didn’t use any lining for mine, so I folded in all of the raw edges. 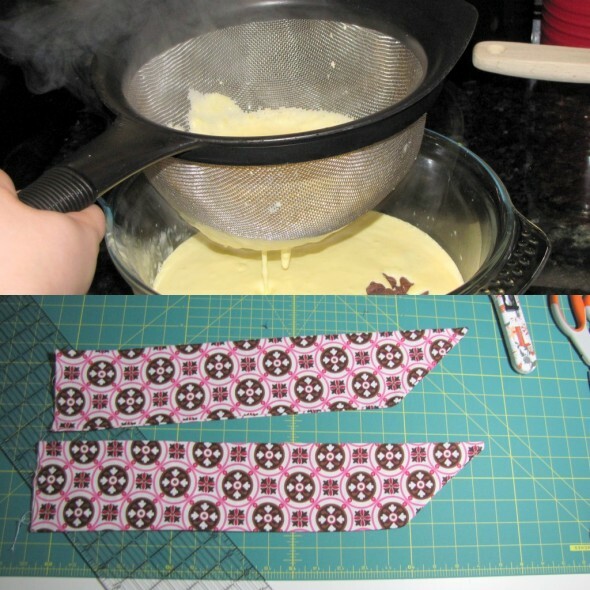 For the pie: Put the bowl of pudding in an ice bath for about 15 minutes, until ribbons form when you run the spoon through. 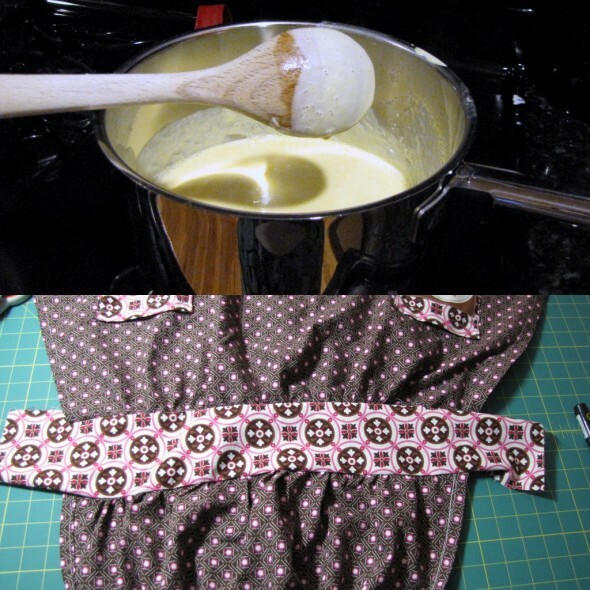 For the apron: Sew the waist ties to the waistband, stitching a rectangle shape to make sure the seams are really joined. For the pie: Pour the pudding into the graham cracker crust. 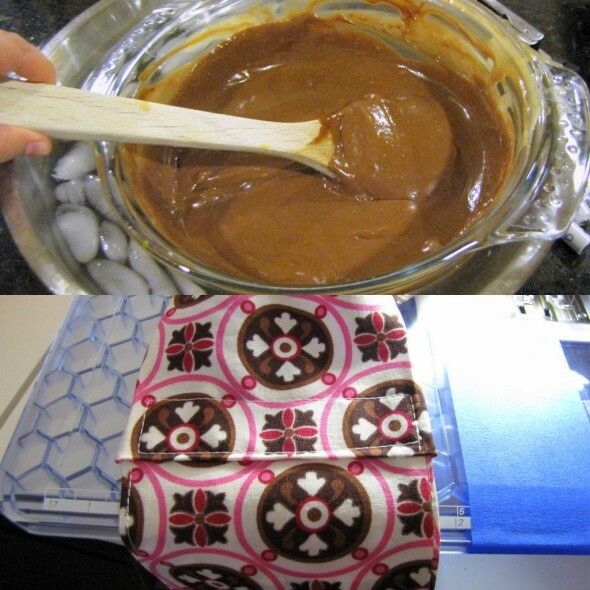 Put saran wrap on the surface of the pudding and refrigerate for at least 6 hours, until the pudding is completely set. For the apron: Your apron is finished now. Model it.